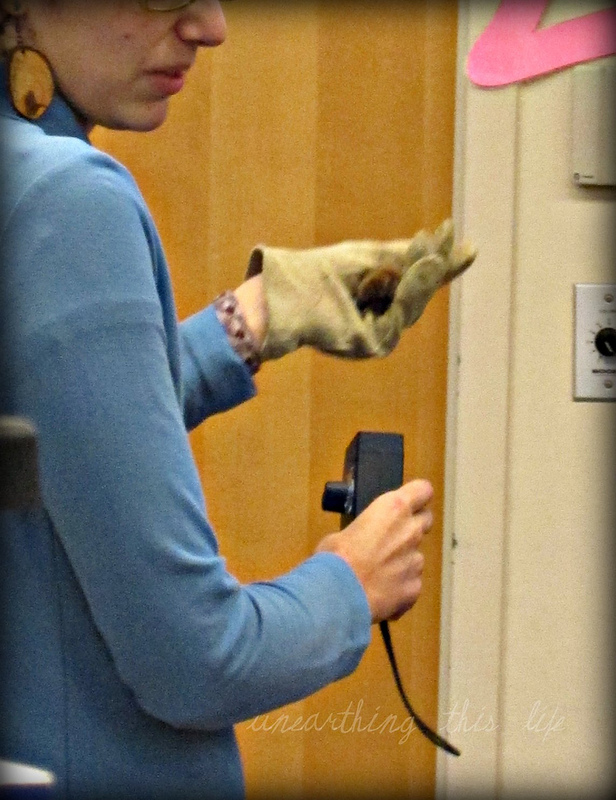 This last week I took my daughter to an activity at one of our local libraries about bats. We had a really fabulous time and learned quite a bit about the only flying mammals in the world. We even got directions to build a bat house and learned how we can help with bat conservation. And aside from the probable fire code violations for having stuffed about 300 people in a room built for a max of about 50, we had no issues with bats getting loose and flying into people’s hair; no one got rabies; and not a person had their blood sucked. In fact, out of the 1,105 species of bats in the world, there are only three species of vampire bats – and they live in the tropics from southern Mexico down to South America. Not really a fun fact for Halloween, but it should relieve some people that have chiroptophobia, or an irrational fear of bats. Yes, that’s a bat – the “Big Brown Bat“. It’s what we commonly see here in the Eastern part of the U.S., and it’s only 4-5 inches tall! Not so big after all, eh? The true big bats are in the tropics, and are sometimes called Flying Foxes. In the tropics, there are fruit-eating bats that help with seed dispersal. Without the aid of bats those bats, many of the tropical ecosystems would be out of balance: they are that beneficial. And then there are nectar-drinking bats that help with the pollination of plants like the mango, cashew, and bananas.The saguaro cactus in our desserts here in the U.S. have help with pollination thanks to these bats. Bats are also a super beneficial creature for us organic gardeners. Insect eating bats eat approximately 1,000 to 6,000 insects a night (the equivalent of eating our own height in pizza every hour for about 6 hours straight!) including mosquitos, tomato hornworms, wasps, cutworm moths, cucumber and potato beetles, and corn earworms. If you’d like to take advantage of a native and organic means of pest control – try enrolling the help of bats. They’ll feed on nighttime flying insects, including pollinators, so be sure to have plants that will attract these pollinators to increase your bat population. Evening primroses, moonflowers, and phlox are just a few. Batconservation.org is a great website with tips on gardening for bats (they were our hosts for our evening at the library). This same website offers instructions for building your own bat houses – an excellent winter and early spring craft project, methinks. Since bats hibernate in the cold season, you’d want to have housing available when they start forming maternity colonies (bats mate in the fall before they hibernate). And finally, the site has some really great facts for kids, teaching links, information on the medical advances thanks to bats, and lots of FAQs. I’ll also direct parents and educators to Step into Second Grade with Mrs. Lemons, where she shares some fun PowerPoints that she made about bats for her second grade class. NatGeo Kids has a fun presentation about the fun and spooky Vampire bat, and Defenders of Wildlife has some great information regarding the conservation of bats and even helps you “adopt” a bat. Jennifer can also be found at Unearthing this Life, in her kitchen, or reading stories to her daughter. Where have all the Markets gone? Alas, this weekend marks the end of October and, for many, the end of the Farmers Market season. Of course the second best place to get your local Unprocessed fix is the Farmer’s Market; the first is obviously the garden out back. I’ll be spending my weekend at the various farmers markets, between various trips out back to my own garden to glean the last of the harvest of kale, brussels sprouts and pears. We are lucky to live where we do because in Ann Arbor, Michigan there is an outdoor (canopied) Farmers Market that runs all year long, as well as an Artisans Market that runs through the holiday season. We also live within short driving distance of Plum Markets and Holiday Markets, who are two locally owned grocers that are kind enough to post where most of their produce comes from (as well as Whole Foods who does the same, despite being big-box). Still, almost all of the markets in the area are closing their gates this weekend. This is when I start to peer nervously into my freezer and around my kitchen at the shelves; will there be enough food to keep us eating responsibly through the winter? Oh goodness, No. The frozen fruits and vegetables will be gone, likely used before the end of the year. 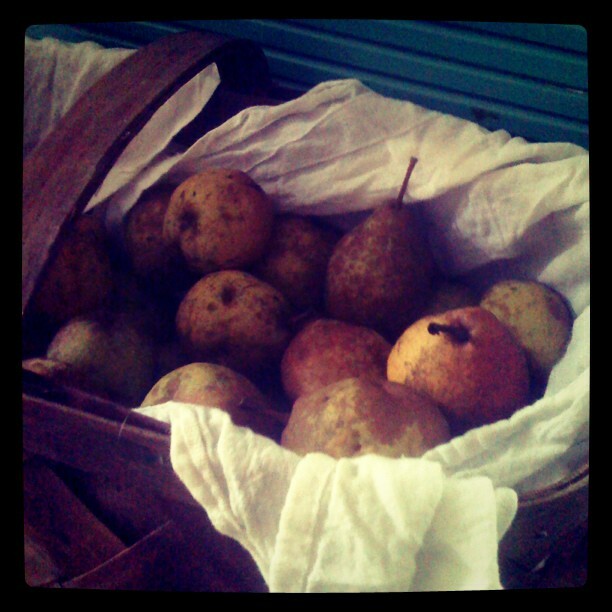 The apples and pears may last, assuming they stay comfortable in their little makeshift root cellars of sand in the pantry. So what happens after we’ve run our own supply dry? Well, we definitely have access to local meats and grains – it’s only a matter of 2-3 weeks before the drakes and the roosters go off to freezer camp – and many of the farmers around here are better at putting up food than we are so it’s possible to nab some of their preserved harvest at the markets and co-ops. So this weekend I plan to beat my way through the crowds at various Markets in their crowded “Harvest Weekend” chaos. 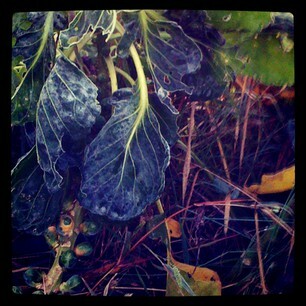 I plan to stock up on the things I wish I’d already stocked up on (winter squash!) and I plan to take a long, deep breath; look around me, and try to think ahead to the markets of spring. Do you have access to local produce year-round? 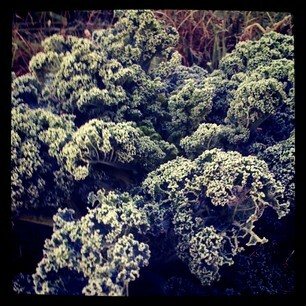 How do you plan to forge through the winter without local markets (or are you lucky enough to have a winter market)? Want to read more from Tanglewood Farm? Check out Emily’s blog over at A Pinch of Something Nice where she writes about her experiences with her gardens, her livestock and her leased historical home in SE Michigan. 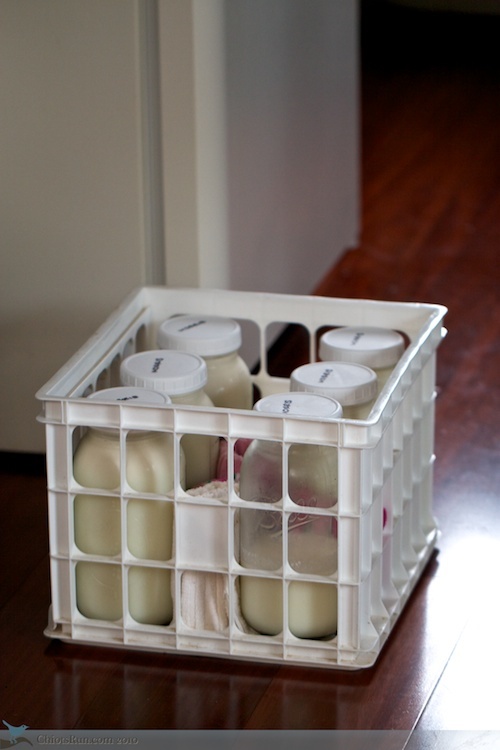 What would I buy if I didn’t have the privilege of buying raw milk from a local farm? I was thinking about this the other day when I poured myself a glass of milk. Luckily, we have another small local dairy that has pastured cows and they use low temperature pasteurization for their milk, no homogenization. When the cows at the local farm are dry in the winter and I have no raw milk (yes, they’re 100% natural let the cows go dry in the winter), I purchase cream line milk from Hartzler’s Dairy in Wooster, OH. I also love that their milk comes in glass bottles, I return these to the store when I get more milk. It’s not as good as my raw milk, but it’s better than regular old grocery store milk. If I didn’t have this dairy to purchase from I’d probably buy Smith’s milk at the grocery store, they’re a larger dairy, but still fairly small and local. A lot of their milk comes from small local organic farmers, and they sell milk without antibiotics, hormones and other baddies. But I’d use this milk sparingly if ever because it’s pasteurized at high temperatures and homogenized. You might be wondering why I wouldn’t purchase organic milk instead. All the organic milk available locally is ultra pasteurized and homogenized, neither of which I like. Most of it comes from huge dairies and I don’t know how the cows are treated, I’ve heard bad things about the cows from Horizon Organic. I’d rather not drink milk, than drink grocery store milk. Once you’ve tasted the goodness of raw milk, you’ll never be able to drink regular milk easily again. The cream line milk we get is good, but it still tastes boiled to us. It also lacks the depth of flavor our raw milk has. You may not realize that raw milk from pastured cows is kind of like wine. The flavor changes throughout the season depending on what the cows are eating, how much rain there is, and other factors. When the grass is growing lushly in spring in fall, the milk is sweet, the cream is extra thick, as yellow as the sun and there’s a lot more of it. When the cows are eating hay in late winter the milk is mild, lighter, there’s less cream and it’s almost white. There are times of the year when the milk has a slightly grassy taste, in the fall I notice that it’s extra sweet and the cream makes superb butter. The truth is that I would go way out of my to find raw or lightly pasteurized cream line milk and would drive quite a piece to get it if needed rather than purchase a homogenized milk product. And of course, I always drink my milk whole since milk fat contains so much healthy goodness, especially from pastured cows! This is one area where I will seek out the BEST, sometimes if needed I’ll settle for BETTER, but GOOD doesn’t even cut it for me in this area. So what are some Good, Better, Bests you can think of? Are there any areas you’ll settle for Good when you can’t get the Best? I can also be found at Chiot’s Run where I blog daily about gardening, cooking, local eating, maple sugaring, and all kinds of stuff. You can also find me at Your Day Magazine and you can follow me on Twitter and on Facebook. Recently a new friend remarked that I had “a lot of rules.” This was in response to my statement that I don’t read the gossip magazines anymore, triggered by the death of Princess Diana, but supported by my belief that we are too susceptible to bread and circuses and that it interferes with our ability to live a mindful life. Susy wrote about this same phenomenon last week, regarding people who feel like your choices are a direct insult to them. But what I’m trying to do is not so much “have a lot of rules” as to be true to my internal political and moral beliefs. You cannot state that you understand global warming and support the reduction of our dependence on fossil fuels, and then sit in a loading zone with the car running, or drive an SUV. You cannot put a sticker on your car that says “reduce, reuse, recycle” and then walk out of the grocery store with 14 plastic bags, especially if you have resusable bags in the trunk of your car. You cannot complain about Big Ag if you get all your groceries at the national chain, and seldom cook from scratch because you don’t want to devote the time. You’re not supporting the local food system if you’re eating at chain restaurants. If you believe that privatization of the commons is a bad thing, then you shouldn’t be parking at the privatized parking meters, or driving and paying a toll on the privatized road. A little inconvenience is a small price to pay,. The political is personal. Your political beliefs should inform your life, not just your vote. When people first meet me, I’ll warn them, I’m different. They will inevitably poo-poo this, stating that I’m just fine (as though I’m looking for reassurance). And then after they know me a little while, they’ll start to realize that in fact, I am different. I choose to live my life in a consistent way, even when it adds cost or inconvenience to my daily existence. The personal is political. Small actions can lead to major change. Live your life by the rules you set for yourself, and mighty empires fall. A few weeks ago Hubby, the Kid, and I went to The Carve, a food carving fair and competition in Holland, Michigan. Since then, our daughter has found every excuse to play with her food. I honestly can’t deny her because I think it’s a great excuse to teach her about food and how to properly use kitchen tools. For about two years, since she was five, I’ve allowed her to help me in the kitchen by cutting vegetables and cooking on the stove. Completely supervised of course. By teaching her proper technique* and making sure the utensils are in good condition, I know that she is less likely to hurt herself – plus she won’t have any bad habits to break later on. I love that allowing her to decorate and carve food has made her more curious about vegetables and fruits she hasn’t been brave enough to sample. Kids naturally like raw veggies, since cooking them changes the sugars making them more bitter – so playing with raw food is a great way to try new foods without the stress of dinnertime. It allows her to explore the food itself, wonder how they grow, and what makes them each such different colors. Do you play with your food? What kind of exposure to you allow your children to the kitchen? *As an Alton Brown fan, I highly recommend watching the episode “Soup’s On” to teach kids how to properly use knives and learn how to play in the kitchen. Jennifer can also be found at her personal blog, Unearthing this Life, where she blogs about homeschooling, cooking Real Food, and dreams about her homestead. 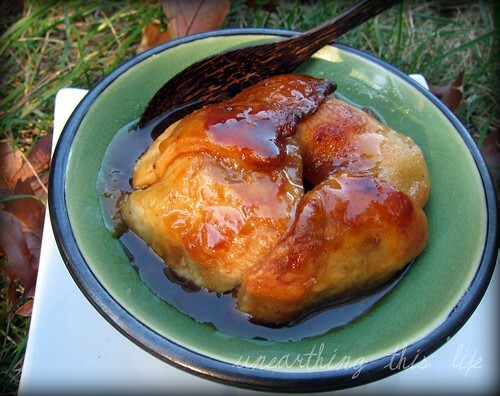 Apple dumplings that are knock-your-socks-off good. 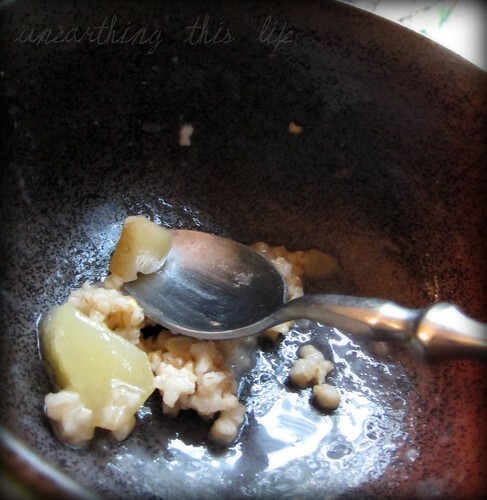 The key to such a good flavor was the boiled cider – also known as apple molasses – that I made. Just a little bit imparts an amazingly intense flavor. Sure you could buy it online and have it shipped, but if you have the opportunity you should try to make it, especially if you can get local apples! So because I couldn’t get enough of that yumminess, I had to make something more…. but better for me. Preheat oven to 400F. Meanwhile add ingredients to dutch oven on the stove top, bringing them just to a boil. Cover and put in oven. Immediately turn off oven. In the morning you may need to add some liquid in the form of milk or water, and to reheat on the stove just a bit. Add ingredients to medium saucepan, and bring to a boil over medium high heat. Cover tightly and lower heat to medium-low, stirring occasionally. 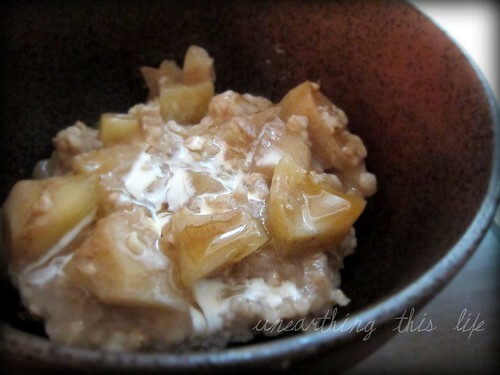 It’s done when your oats are soft and apples are no longer firm. Add ingredients to crock pot and turn on low. Let cook at least 6 hours. Stir gently before serving. Top with a drizzle of fresh cream(and maybe some maple syrup) and enjoy it while it’s still warm! You can find Jennifer at Unearthing This Life where she’s currently focusing on autumn and homeschooling. We spend a lot of time here at Not Dabbling talking about living mindful lives, eating REAL food, reducing the amount of processed food in our lives, detoxing our lives, living more simply and how to achieve these goals. What we don’t often talk about it how the people around us react to these decisions. This really hit me the other day when someone from an internet show visited for a few days. When he talked about us on the show, he said “Wow, these people are great, I love what they’re doing, but they can really make you feel inadequate”. That was the first time someone had verbalized what I knew other people felt. We all live in a community, with a web of people around us, usually comprised of friends and family. It can be difficult for those people around us to come to terms with significant lifestyle changes that we make, whether that be eating less processed food or trying to exercise more. I have found that people around me usually have two distinct reactions; they’re either inspired, or they get defensive; they encourage, or they become negative; they build up, or they tear down. This can be a bit of a problem when the ones tearing down and being negative are those you are closest to. In one way you feel slightly betrayed since they are being negative about something you feel very strongly about. In another way you understand because it’s not something they care about. But if they’re being directly negative about your decisions, not encouraging to you, being negative and pushing back – it’s not healthy – for you or for them. The truth is that it’s really not your fault if people feel inadequate around you because of you bettering your life, I believe it usually stems from guilt. I think deep down they feel they should make some changes but are unwilling to do so. In their mind, you being able to make some changes makes them look bad. What do you do about it? Besides not talking about certain things in their presence, there’s not much you can do. I have certain people in my life that I avoid certain topics around. Eventually however, you might have to make the decision about whether or not they can remain in your inner circle. I really believe that those in your close circle need to be people that will accept you for who you are and accept the changes that you make. They should encourage you in your endeavors, even if they don’t agree with what you’re doing. Sometimes people need to be moved back to the acquaintance category so that someone who will support you can come in and take their place. The farther I get down the road of simplifying my life, leading a mindful life, eating Real food, growing my own, cooking from scratch, and detoxing my life, the less contact I have with some people I used to be close with. As an introvert I do not have many close friends, only a very limited number of people reach that level. I feel the need to surround myself with people that will encourage me and help me achieve my goals in life, and sometimes people are simply unwilling to do that. Right now I’m feeling the pull to trim some of the relationship fat in my life. There are a few relationships that need to be moved bak to the acquaintance level because I simply do not have the time or energy to invest in relationships with people that are negative and defensive around me. I don’t want to spend my time thinking through every single thing I say to make sure I won’t offend them. I want to be able to be open and to talk about things I feel passionate about. I want to spend my time cultivating relationships with people that are good for me mentally. Have you experienced any pushback from family and friends about your journey down the roads towards REAL food, cooking from scratch, simplifying or other decisions you’ve made? I can also be found at Chiot’s Run where I blog daily about gardening, cooking, local eating, maple sugaring, and all kinds of stuff. You can also find me at Your Day Magazine, you can follow me on Twitter and on Facebook.